You'd think that any movie that involves the late great Alfred Hitchcock would be riveting, spectacular and painstakingly suspenseful to watch. But Hitchcock, Sacha Gervasi's debut feature film that follows the days leading up to the production of the filmmaker's classic film, Psycho, is none of the above. Right out the gate, Hitchcock struggles to simply be interesting. Although Anthony Hopkins looks comfortable inside the physical girth of Hitchcock and the actor captures both his enthusiasm for movies while also basking in the perks of being "the master of suspense," John J. McLaughlin's trite screenplay gives him little to work with. It makes his performance look like a great imitation, at best (reminiscent of Meryl Streep in 2009's Julie & Julia). Instead of offering a candid and enlightening view of Hitchcock outside of his work, or even his deeper psychological thoughts behind Psycho, we get an artless chronicle of Hitchcock's financial straits and lack of support from the studio. After McLaughlin's brilliant screenplay for 2010's Black Swan, this is a real letdown. Another thing the film focuses on is the infamous shower scene in Psycho. Arguably one of the finest shot scenes in film history, Hitchcock spends so much time enticing the audience with it that when it happens, it's just not special and just a quick moment. It really just plays up Hitchcock's satisfaction with the audience's reaction to the scene. Then it all fades to black. You just don't do Hitchcock like that. The one-dimensional character development doesn't end with Hitchcock. Helen Mirren's lady Hitchcock (Alma Melville) is not much better realized. Mrs. Hitchcock's story almost solely exists as an aside to her husband's. Granted, the movie does show that she was more than just a wife; she was her husband's right arm. She often helped rewrite his scripts, including Psycho, and appeared to be the glue that held her husband's motivation for his career, even when he was deemed too old for Hollywood and the cards were stacked against him. Her talent was apparently overshadowed by her husband's success. The arc is far too bland for an actress of Mirren's caliber, but at least Mirren gets a few zingers to deliver to counter Hopkins' "Try the finger sandwiches. They're made of real fingers." Lines like that will undoubtedly give you a twinkle in your eye, since it's easy to believe that Hitchcock the man might have had a fondness for perverse humor like that. But it just seems like lazy writing if you throw a couple of lines like that here and there when the rest of the film left much to be desired. 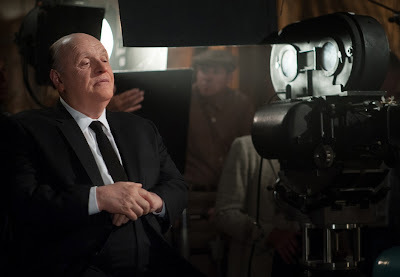 With an impressive cast, including Toni Colette and Scarlett Johansson, and a rich subject, Hitchcock really should have been a better movie. Colette was completely underused as Hitchcock's assistant, and Johansson's portrayal of actress Janet Leigh provided nothing more than a few quips about her décolletage and screaming in the shower. Cloud Atlas' James D'Arcy as Anthony Perkins is a dead ringer for the actor, even if he only had one tepidly compelling scene with Hopkins that digs into the character. Even Jessica Biel as actress Vera Miles is decent, even though her storyline had such potential but was glazed over and ultimately flatlined. Gervasi at least manages to recapture the essence of Hollywood in the 50s and 60s with a recreation of the vintage studio lot and classy Tinseltown fashion. But stripping the character down to a point where his fictional depiction is far less fascinating than the actual persona seems counterproductive. If Hitchcock himself was alive today, he'd undoubtedly turn his nose up. Wow, really surprised you disliked this one that much. I'd be curious to read your thoughts on HBO's The Girl. Whoa! Not a good grade. I didn't have high hopes for this, but I'm interested in seeing it to compare with The Girl. Good review Candice. Not a perfect by any stretch of the imagination, but still pretty entertaining and fun to watch, mainly because of Hopkins and Mirren's performances.